Thanks to the generosity and inspiration of our alumnus Richard Tsai, we can help transform these challenges into exciting opportunities, staying as relevant to the new economy as we are to Wall Street. Today New York University’s Stern School of Business announced the establishment of The Fubon Center for Technology, Business and Innovation, made possible through an $8 million endowed gift from alumnus Richard Ming-Hsing Tsai (MBA ’81), Chairman and CEO of Fubon Financial Holding Co., Ltd. together with Fubon Financial Holding Co., Ltd. The Fubon Center will serve as the School’s hub to support, facilitate and enhance cross-disciplinary collaboration among its existing areas of excellence in technological innovation, including: FinTech, Business Analytics, Technology and Entrepreneurship. As a new nexus for continuous innovation at Stern, The Fubon Center will serve to strengthen and build industry ties, focusing on cutting-edge research that creates impact for business. The Fubon Center will also help shape future coursework to align with a rapidly evolving business landscape. Additionally, The Fubon Center will help foster academic collaborations between Stern and National Taiwan University, Tsai’s undergraduate alma mater. Richard Tsai is the Chairman of Fubon Financial Holding Co., Ltd. and Fubon Life Insurance Co., Ltd. Tsai has more than 30 years of experience in financial and insurance businesses. 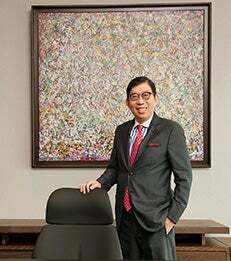 He is also currently the Vice Chairman of Taiwan Mobile Co., Ltd. Tsai holds a Master of Business Administration Degree (1981) from NYU Stern and a Bachelor of Laws Degree (1979) from National Taiwan University. The establishment of The Fubon Center for Technology, Business and Innovation is the latest in a series of new initiatives at the intersection of technology and business that Stern has introduced over the past 18 months. Stern was the first among top business schools to deliver a course on the blockchain in 2014, which led to the creation of an official FinTech specialization in the MBA program in 2016. This past May, the School launched a Tech MBA, a one-year specialized MBA program that integrates business with technology coursework, as well as experiential learning projects with companies through its Stern Solutions programming.